An epilectic (Lou Castel) decides to relieve his older brother (Marino Mase) of their dysfunctional family by gradually killing everyone — including himself — off. This astonishing feature debut by Italian director Marco Bellochio merits multiple viewings in order to begin to grasp its bizarrely twisted mentality. We watch the movie — part black comedy, part character study, part horror film — as we would a train wreck in slow motion, fascinated yet unable to look away. Indeed, it’s impossible to predict what will happen next, since none of the characters behave as you would expect them to: Mase barely bats an eyelid when reading about Castel’s intent to drive their family off a cliff; Castel’s sister (Paola Pitagora) treats her disturbed brother more like a lover than a sibling; and nobody in the community questions the sudden mysterious deaths of two of the family’s members. Like it or not, we end up most fascinated by the dynamically deranged Sandro (Castel), whose powerhouse performance (watch the way he swings his hands and arms around) evokes memories of a young Brando. Rather than having Sandro consumed with vengeful jealousy over his older brother’s success in business and love (a much more conventional narrative choice), Bellocchio shows Sandro teetering between depression, grandiosity, and mental instability, all while ostensibly aiming to provide his “normal” older brother (does he wish to be him? or is he simply trying to “prove” himself to him?) with a chance at happiness. Sandro’s fate is sealed in the final baroque moments of the film, but (as to be expected) it’s unclear what kind of a future lies ahead for the remains of this highly dysfunctional family. Ennio Morricone’s intermittent score — if only there were more! Yes. This powerful, provocative debut by Bellocchio merits viewing by all film fanatics. A must and a true masterpiece–not a word normally used for a debut. 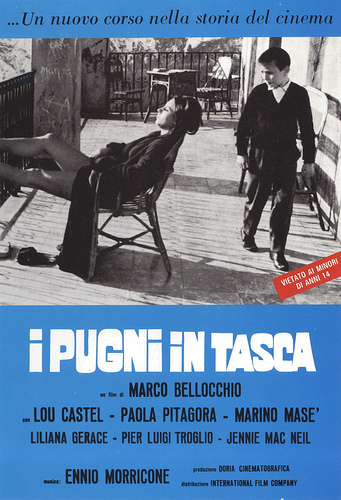 Oddly though for a filmmaker, it appears Bellocchio burst on the scene with the kind of cinematic curveball that threw directors of its day (reportedly, Bunuel and Antonioni were not pleased) and influenced a generation in pervasive ways, but ended up being something of a curse for its creator. Bellocchio still makes films but many of them are not well-known in the US. Some that have made their way here, like 1967’s ‘China Is Near’ and 1986’s ‘Devil in the Flesh’, seem almost listless compared to the volcanic ‘FITP’. Mainly since the film dispenses with set-up and the viewer is simply tossed in, it does lend itself to multiple viewings. But that’s not to slight the marvelously complex performances of its stellar cast who, as stated here, operate against expectations. ‘FITP’ is, essentially, a love story from a very gothic angle: as Alessandro asks his older, ‘stable’ brother Augusto, “Why should you let us poison your whole life?” Though the family is wildly dysfunctional, there is a bond that makes the proceedings distressing (the most touching scene unfolds when Augusto takes Alessandro to a party and, at one point, looks on him lovingly). Overall, this is a very rich film experience that certain film fanatics may want to return to from time to time.